The food truck park next to McAllen Chamber of Commerce on Monday, Oct. 8, 2018, in McAllen. 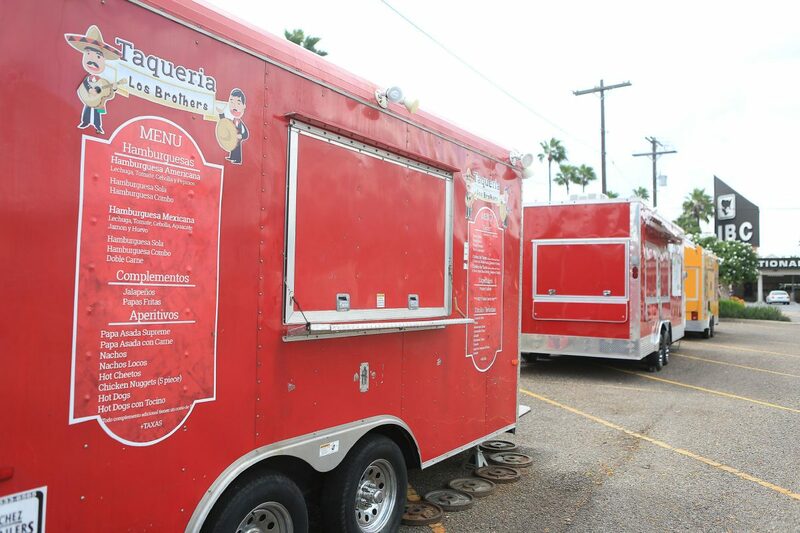 McALLEN — After a five-year exploration period, city commissioners are expected to lift several restrictions on food trucks, a sign the city is willing and ready for mobile food vendors to expand. The proposed ordinance, which city commissioners tabled at Monday’s commission meeting, would remove the permitting cap on the number of food trucks in the city and would allow food trucks to operate in one spot, pending approval with the property owner, as long as they’d like, at any hour of the day. While the current cap on the number of food trucks operating in the city is 12, there are dozens of the mobile vendors currently operating in the city, according to City Manager Roel “Roy” Rodriguez. The city began its mobile food vendor ordinance in 2013. The ordinance prohibited operation between 3 and 6 a.m., restricted how long vendors could stay in certain spots and capped the number of permits it could distribute to food trucks at 12. But, the city had not revisited the ordinance, and has distributed dozens of permits since then. Commissioners wanted some clarification on the new ordinance, which is why they tabled the item at Monday’s meeting. The new ordinance is expected back at the next scheduled meeting later this month. The food trucks in McAllen have helped nurture the city’s fairly diverse food scene, something that often surprises first-time visitors. Two of these food trucks in recent years have fueled the food diversity growth: Motoramen, a ramen noodle food-truck-turned-brick-and-mortar restaurant, and Nuri, a Korean-Mexican fusion restaurant that was also formerly a food truck. Nuri has established itself in North McAllen for nearly a year now after existing as a food truck for a year-and-a-half. Gabriel Fuentes, the owner, likes how the scene has grown. The food truck park along Business 83, next to Archer Park, features a variety of cuisines, and has been a focus and an account of pride for city leaders. But the park is often empty during the day due to scorching South Texas heat and a lack of shade that only exists for a few benches. As more food trucks pop up across the city, though, officials are expecting varying locations. Fuentes is, too.